Deadspin has learned that ESPN’s recent loss of three million cable subscribers, which was followed by a significant drop in its parent company’s share price, has attracted the attention of a high-powered law firm that specializes in bringing class-action lawsuits on behalf of defrauded investors. On Nov. 25, 2015, Disney’s stock price was at $118.67 per share. That same day, Disney submitted its annual 10-K filing to the Securities and Exchange Commission, which revealed that the ESPN cable network—80 percent owned by Disney—had lost three million subscribers in the fiscal year that ended on Oct. 3. When the market reopened on Nov. 27, Disney’s stock went into a sustained free fall, reaching a low of $88.85 per share on Feb. 10. Currently, Disney’s stock price is sitting at $96.42 per share. ESPN is Disney’s greatest profit center, and the subscriber loss was enough to send Disney investors into a mild panic; it was also enough to get the Labaton Sucharow law firm thinking about a potential securities fraud suit. Sources tell us that Labaton Sucharow has reached out to former ESPN employees in an attempt to gather information that could be used in a potential class-action suit against Disney. According to a source, the firm is particularly interested in any internal ESPN or Disney documents—emails, meeting notes, slideshow presentations—that could prove Disney knew the exact severity of the subscriber loss during the 2015 fiscal year, but chose not to reveal it to investors. The question at hand is if Disney executives knowingly misled investors by publicly expressing confidence in ESPN’s subscriber base while they were privately aware that a big drop in subscribers had occurred. According to Adam Pritchard, a University of Michigan law professor with an expertise in securities fraud, Labaton Sucharow would have to clear two hurdles in any lawsuit. First, they would need to prove that Disney was knowingly misleading investors or acting recklessly in not revealing the subscriber loss before the end of fiscal year 2015. Second, they would need to prove that the subscriber loss that was revealed in the SEC filing in November was the driving force behind the drop in Disney’s stock price, which certainly seems to be the case given how most market analysts reacted to the news. “If Disney executives knew ESPN had suffered a substantial loss of subscriptions in fiscal year 2015, they will need a credible explanation for why they didn’t reveal that loss to investors before the end of the year,” said Pritchard. No official complaint has been filed yet, but it’s not uncommon for firms that specialize in securities fraud cases to take a hard look at companies that suffer sharp and unexpected stock hits. In such cases, what a firm like Labaton Sucharow is looking for are former employees of the company in question who can tell them whether the bad news that led to the sudden drop in stock price—the three million lost ESPN subscribers, in this case—was actively concealed by the company. It’s not hard to see why Labaton Sucharow would set its sights on Disney, which spent the end of the 2015 fiscal year speaking only in the vaguest terms about ESPN’s subscriber base while assuring investors that the cable network was in great shape. Disney has not yet returned a request for comment. Labaton Sucharow declined to comment on this story. The SEC, as is standard, also declined to comment on whether Disney is currently under investigation. Operating results at ESPN were driven by growth in affiliate revenue, partially offset by lower advertising revenue. The increase in affiliate revenues was due to contractual rate increases and an increase in subscribers. The increase in subscribers was due to the new SEC Network launched in August 2014, partially offset by a decline in subscribers at certain of our networks. Q: Okay, thanks. And then, Bob, something you said at the beginning— it’s a question that I know all of us get and Lowell gets too. It’s about the right number of subscriber losses at ESPN, and all us track Nielsen, you put it in your 10-K in terms of the yearly change in ESPN subscribers. What’s the right level of subscriber growth? And when you think about your current guidance, what is the right level of future near-term subscriber losses, do you think, for ESPN, maybe for the basic bundle in total? A: Well, first of all, Michael, we report in our filings Nielsen’s numbers. But they don’t necessarily track the number of subs that we get paid on. And in fact, the numbers that have recently been in the press, which were Nielsen numbers, were higher in terms of sub losses than those that we’re seeing. But we are not, at this point, ready to give specifics in terms of what those numbers are. Does that answer that question? One of the reasons it is difficult to figure out ESPN’s exact subscriber base, according to Moffett Nathanson analyst Michael Nathanson, who asked the question above, is because non-disclosure agreements between networks like ESPN and cable providers like Comcast prevent companies like Disney from being able to publicly reveal exact subscriber counts. The number of ESPN subscribers that Disney reports to the SEC is based on Nielsen estimates, and so when Iger tells his investors that Disney’s internal numbers disagree with Nielsen’s data, they have no choice but to take him at his word. The Nielsen data that Iger claimed were inaccurate estimated that ESPN had lost 3.2 million subscribers in a little over a year. The press release’s vague language and Iger’s inability to offer up hard numbers did nothing to dispel the specter of ESPN subscriber loss. That uncertainty was enough to send Disney’s stock on a nine percent tumble over the course of one day. The stock price eventually rebounded, and when it came time for Disney to report on its 2015 fourth-quarter earnings, the language used to describe ESPN’s performance was just as opaque as it was in August. Operating income at Cable Networks increased $381 million to $1.7 billion for the quarter due to an increase at ESPN and, to a lesser extent, A&E Television Networks (A & E) and the Disney Channels. The increase at ESPN reflected higher affiliate and advertising revenues, partially offset by an increase in programming costs. Affiliate revenue growth was driven by contractual rate increases and an increase in subscribers. The increase in subscribers was due to a full quarter of the SEC Network, which launched in August 2014, partially offset by a decline in subscribers at certain of our networks. Okay. Well, regarding your first question, there’s nothing that I would either retract or in any way change. To just reiterate what we did, we updated guidance that we had given in 2014 about ESPN’s sub fees, and that guidance holds today. We also decided to be candid, I think maybe refreshingly so, about what the industry was experiencing in terms of sub losses during roughly the last period. And we feel that there certainly should be no reason to panic over comments like that. The fact remains that we’re in an environment today that’s definitely changing. It’s different than the environment before. There’s a lot more competition for people’s time. With that interestingly enough, we have an opportunity to distribute our content in many different ways than we ever have before—in more different ways than we ever have before. So there’s not only a silver lining, but there’s a glass half full perspective on this, and that’s what we have. We also know, specifically related to ESPN, that not only is the brand strong, which is evidenced, by the way, in the ratings—50 of the top cable shows in fiscal 2015—of the 50 top cable shows in fiscal 2015, 26 were ESPN’s—and in addition to that, live television and live sports in particular is incredibly strong in this environment, demand for it has probably never been greater interestingly enough. So that’s I guess a long way around my saying that we don’t have anything to really add to the comments that we’ve made. 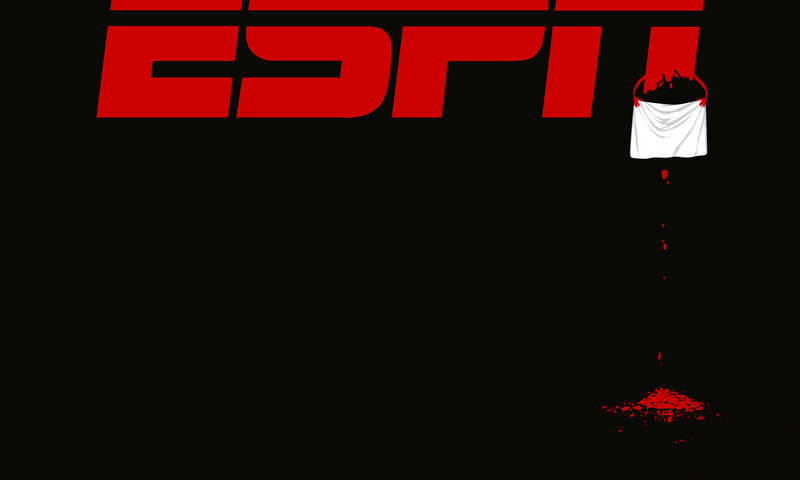 We feel bullish about ESPN and ESPN’s business. We like the environment because we think long-term it gives us more opportunities. I should also add that ESPN has been at the forefront of using technology to create more compelling product for its consumers and to be present on more platforms. Twenty days later, Disney filed its 2015 fiscal year earnings report to the SEC. That report revealed—via Nielsen estimates—that the number of ESPN subscribers had dropped to 92 million in 2015, a decrease of three million subscribers from the previous year’s filing. Since then, Disney’s stock price has yet to climb back above $106 per share. It might seem strange that a company as massive and successful as Disney can have its stock price so heavily influenced by one of its many cable networks’ subscriber base dropping a few percentage points, but ESPN has long held a tremendous amount of sway over Disney’s portfolio. This is largely due to the network’s absurdly high carriage fee—cable subscribers paid $6.04 per month to receive ESPN in 2014; TNT carried the next highest fee at $1.48 per month—which compounds the damage anytime there is a significant loss in subscribers. When three million people who were paying your company $72.48 per year suddenly disappear, that’s a real loss. You can see why investors would want to be kept abreast of ESPN’s subscriber numbers throughout the fiscal year, and why language like “decline in subscribers at certain of our networks” and Iger’s casual reference to “modest” subscriber losses could rankle. You can also see the questions a firm like Labaton Sucharow might be interested in answering: When exactly did Disney know that ESPN was going to lose three million subscribers in 2015? Why did Iger continue to project confidence in ESPN if he knew such a dramatic subscriber drop was coming? At this point there is no reason to believe that a class-action suit against Disney is imminent, as our sources tell us Labaton Sucharow is simply attempting to gather information for now. But given the firm’s pedigree—they have previously secured a $725 million settlement from AIG and a $170 million settlement from Fannie Mae—Disney has a lot riding on what sorts of answers Labaton Sucharow’s investigators find.